American history is alive and well in Boston. Massachusetts' capital was founded by the Puritans in 1630. You'll find that the city's pivotal role in the American Revolution is still palpable as you walk along its two and a half mile Freedom Trail in downtown Boston. You can almost hear the hoof beats of Paul Revere’s horse clomping down the street. Copley Our 4-Star classification designates those properties with well-appointed, deluxe accommodations, extensive amenities and comprehensive guest services. Expect attention to detail and a warm and hospitable staff ready to cater to your needs. These superb properties offer a truly refined getaway. Back Bay Our 4-Star classification designates those properties with well-appointed, deluxe accommodations, extensive amenities and comprehensive guest services. Expect attention to detail and a warm and hospitable staff ready to cater to your needs. These superb properties offer a truly refined getaway. 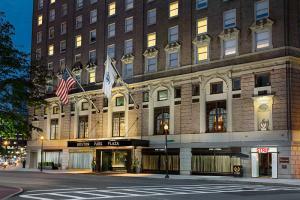 This hotel commands breathtaking views of Boston, and well-appointed accommodations. 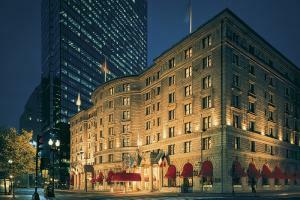 A Boston landmark, this hotel in the fashionable Back Bay neighborhood epitomizes sophisticated elegance. A symbol of Boston's rich history and elegance since it's gala opening in 1912, this hotel features lavish decor and thoughtful amenities. 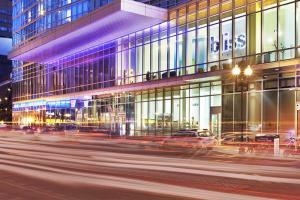 Boston Theater District Our 4-Star classification designates those properties with well-appointed, deluxe accommodations, extensive amenities and comprehensive guest services. Expect attention to detail and a warm and hospitable staff ready to cater to your needs. These superb properties offer a truly refined getaway. This downtown hotel is full of boutique touches and a chic, sophisticated ambiance.